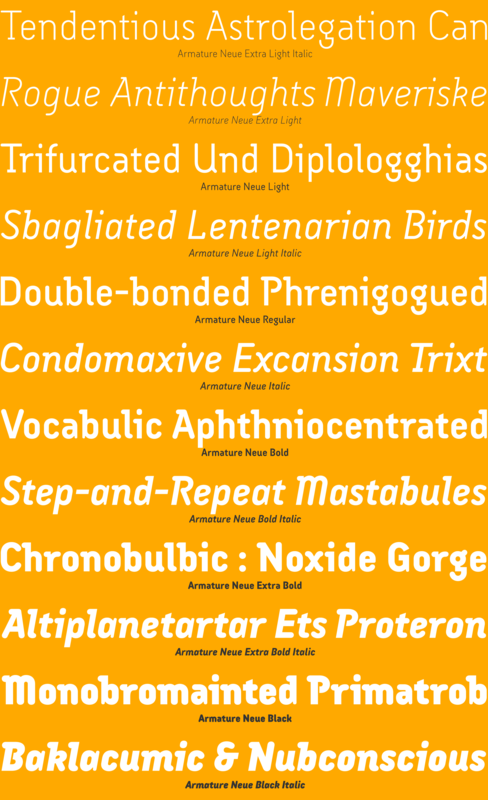 Armature Neue is an extension and clarification of the original Armature family released in 1997. We made the distribution of weights more even, and added italics extra light and black weights. Originally consisting of four fonts, Armature Neue has twelve: six weights with accompanying italics. Although conceived as a display face, a number of alternate characters are included that can be used to regularize the type for text setting. Armature is one result of Bob Aufuldish’s interest in typefaces that are constructed, rather than drawn. Although it is basically a monoline design, there are subtle details throughout that compensate for a monoline’s evenness. As with all fontBoy fonts, there are dingbats hidden away in the dark recesses of the keyboard. When Afouldish first started designing this face in 1992, he called it Dino — he thought he would name all my fonts after famous pets-so the dingbats for Armature are dinosaurs. The Armature Neue fonts contain Western and Eastern European characters, ligatures, stylistic alternates, and more.